The Marriott Hotel is one of our favorite hotels in Riyadh because their staff and management are friendly and their interior design is a wonderful combination of both tradition and modernity. 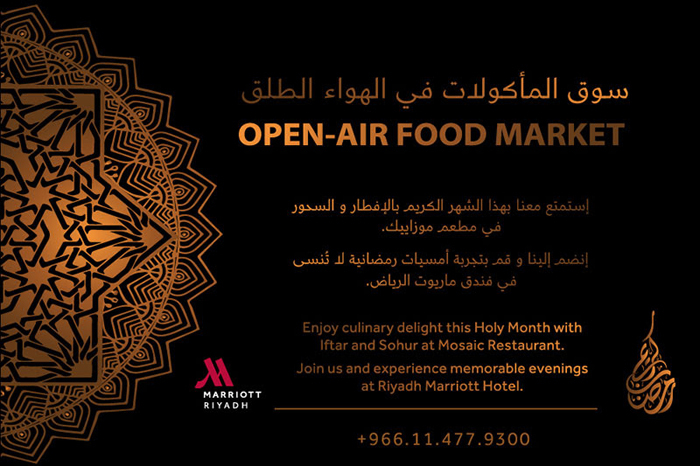 They’re introducing an “Open Air Food Market” concept at the Mosaic Restaurant for this year’s Ramadan. The Open Air Food Market concept of the Marriott is intriguing. 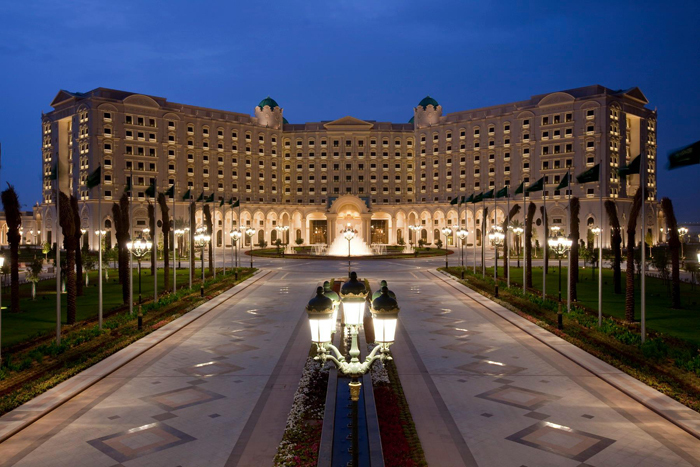 The Ritz Carlton Riyadh is probably the most popular hotel in Riyadh. 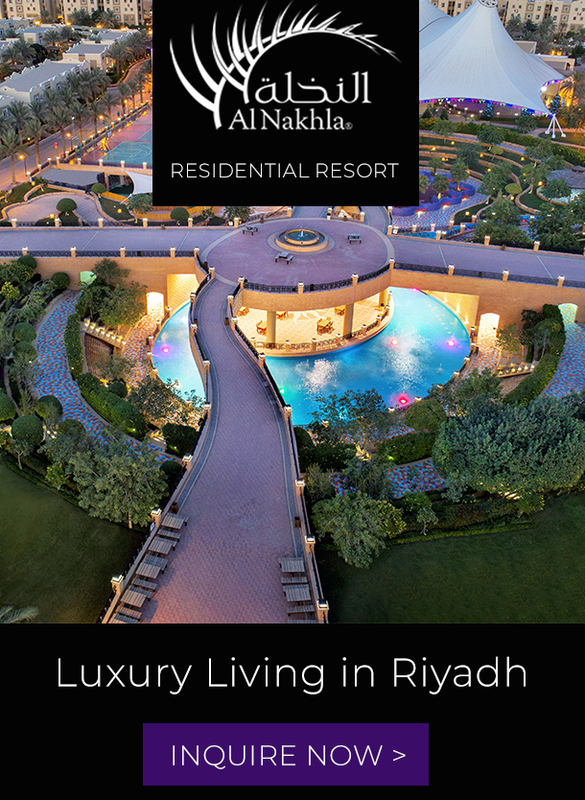 With its palatial setting and lush gardens, it’s a luxury in this desert city. 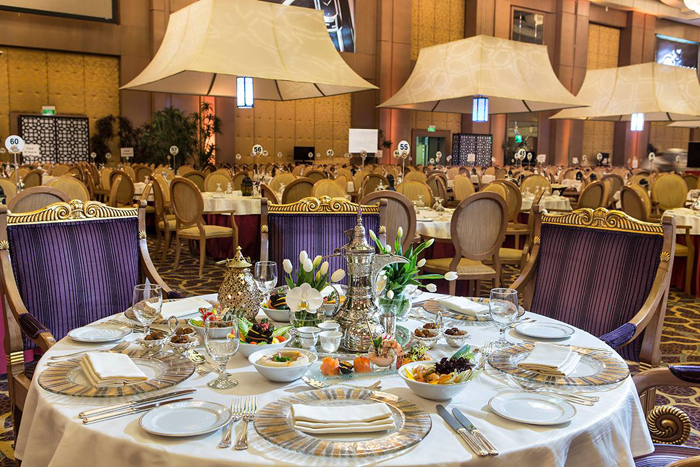 The Ritz is having its iftar in their Ramadan tent while their suhoor at the Al Orjouan Restaurant. 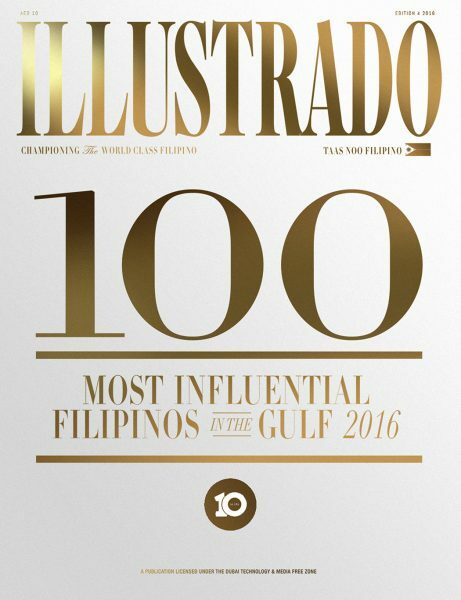 Both are offering international cuisine in their massive venues. 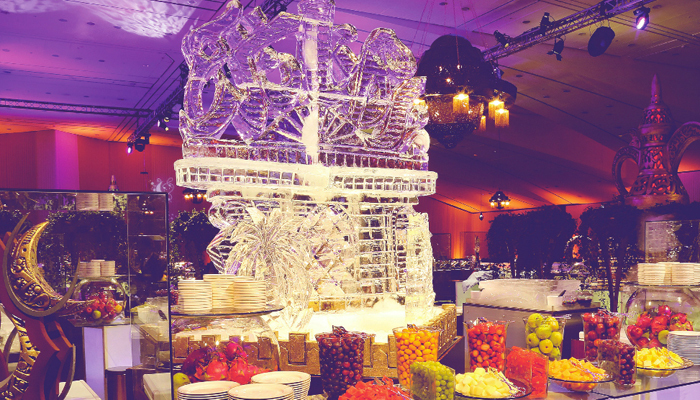 The Ritz is always a favorite for buffet dinners. The Four Seasons Hotel at the Kingdom Tower continues to revel guests in their gorgeous decor and panoramic views of Riyadh. Their restaurants are also known for their creative menus and attentive service. Visit the Toy Town area in their Ramadan tent too this year and your kids will surely enjoy their iftar as much as you do. Ready for the Four Seasons Ramadan Tent? Narcissus Hotel and Residence is fast becoming a must-visit hotel in Riyadh with its unique architecture and Argentinian restaurant, Pampa Grill. Its location is also ideal for those who wants to be in the heart of the city. Newcomer Narcissus Hotel is ready for Ramadan. 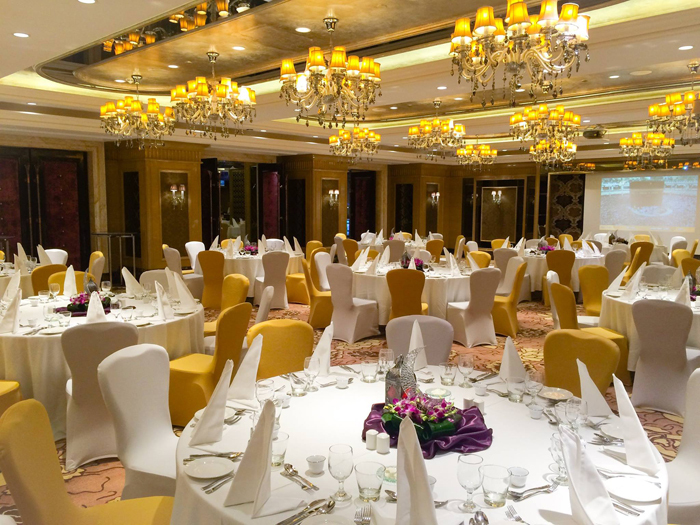 Burj Rafal Hotel Kempinski is a 5-star hotel located away from the city center. 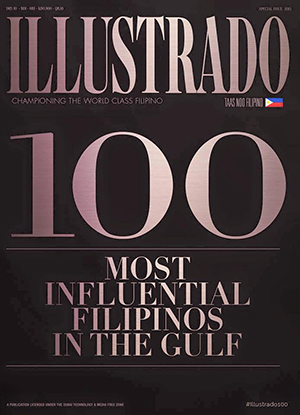 It boasts of European elegance with a touch of Arabian hospitality. We’ve been invited to events that were held in this hotel and we’ve also enjoyed one brunch in their outdoor cafe. It would be great to try this for Ramadan celebrations. 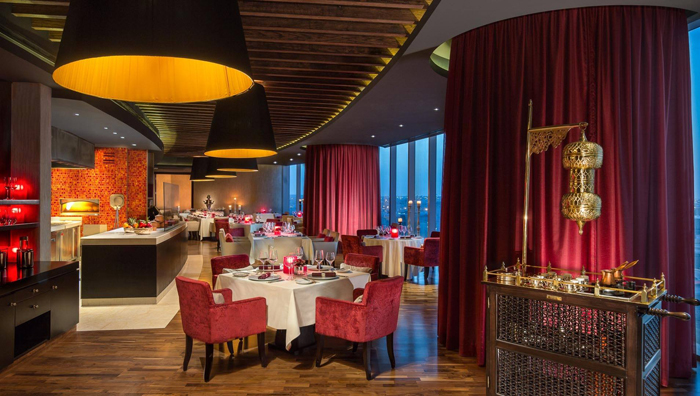 The Turga Restaurant in Burj Rafal offers suhor and stunning views of the city. Al Faisaliah Hotel brings their signature “Fawanees experience” this season with a hearty buffet of international dishes. Try their iftar in their restaurant and their suhoor in La Cucina. Wonderful Ramadan fever at the Al Faisaliah Fawanees. 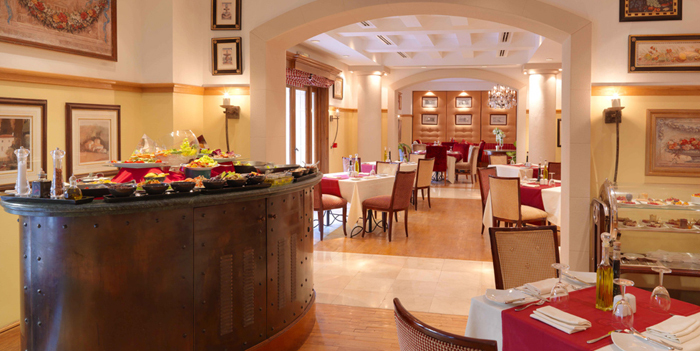 Hotel Alkhozama is part of the Rosewood line of luxury hotels and resorts. It gets overshadowed by its sister Al Faisaliah Hotel most of the time but we actually love Hotel Alkhozama’s restaurant, Garden Barbecue. Garden Barbecue in Alkhozama is one of my fave hotel restos. 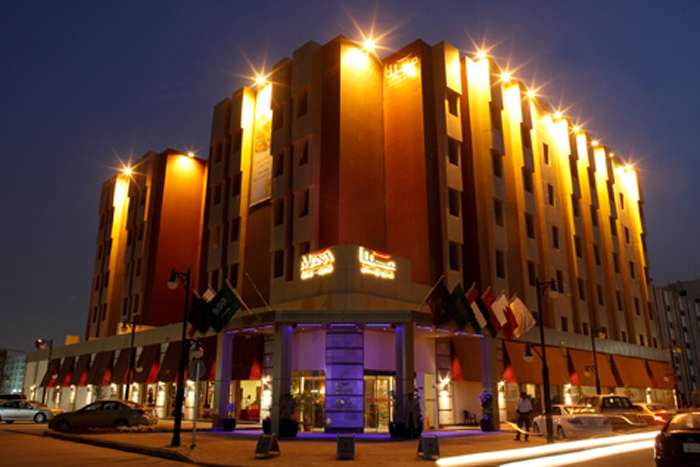 Radisson Blu Hotel in King Abdulaziz Road is both a leisure and business destination. It doesn’t have the fancy swag of the new hotels now but it still offers one of the most affordable international buffets when Ramadan comes rolling in. Radisson Blu’s restaurant (pic not yet of their Ramadan scene). Again, you have to buy the vouchers at Cobone first before you can avail of the discounted prices for these hotels. They have more choices; just visit their Iftar and Suhor deals page. There you go, the Ramadan tents and buffets for 2015. If you have tried any of them and would like to give feedback, please do so in the Comment section below. Also, if you’ve tried a worthy meal that isn’t here, then please comment too! Hotels for now, the entry on restaurants will be coming soon. *** Photos of hotels are from their respective Facebook pages and Cobone. Janelle, speaking of Ramadan, is there any special operating hours for the malls during this season? Just wanted to say Hi ! and Thanks a lot for everything you have been doing on this website. 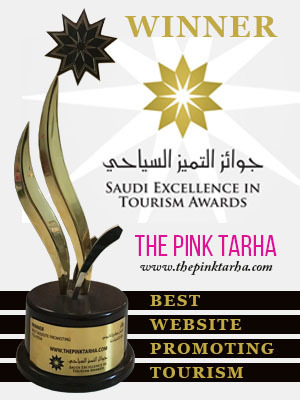 Each post of your’s is very informative and beneficial too. Keep up the good work ! 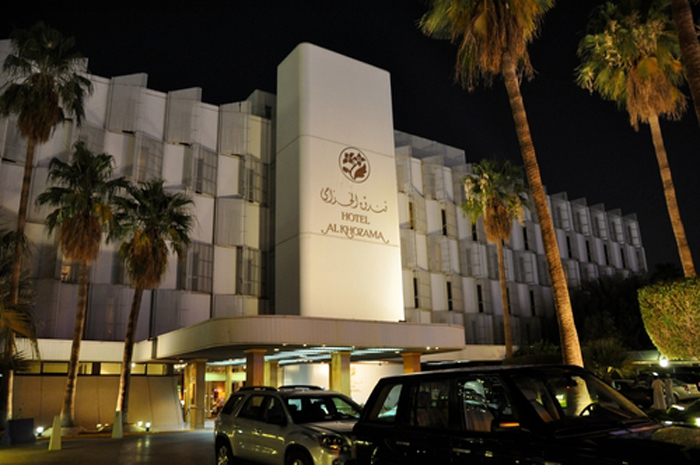 How about Suhoor at Makarim hotel near the airport ?